Hotstar UWP app for Windows 10 is now released. Hotstar is a digital and mobile entertainment platform owned by Novi Digital Entertainment Private Limited, a wholly owned subsidiary of Star Network India. With free Hotstar UWP app users can watch TV shows and movies on any Windows 10 device. 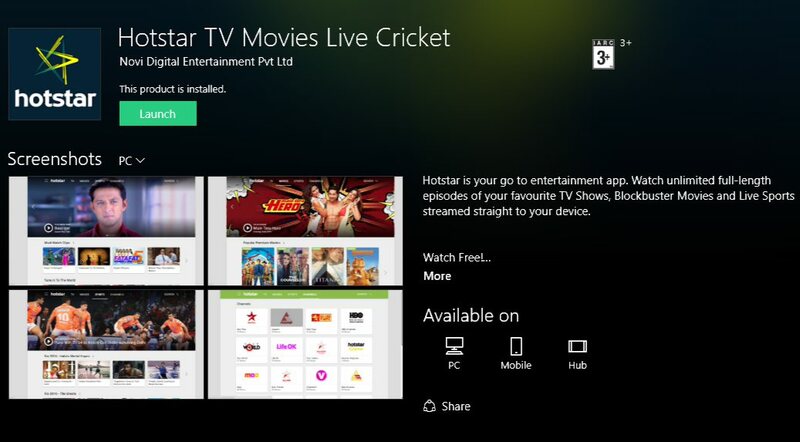 Users can now download Hotstar universal app from Windows store. Developers pointed out that premium contents will not work because DRM hasn’t been enabled yet. Free Streaming of TV Serials, Movies, Sports and More. Ball by ball live cricket scores and updates. The best video experience on any bandwidth even on mobile data. Apps adaptive video quality setting automatically adjusts itself to the bandwidth available and both saves your data as well as delivers the best experience. Hotstar will remember where you stopped watching, as a result app resumes from where you left off.